Nestled on 25+ acres in the suburbs of Mclean , Virginia [approximately 2 miles south of America’s Spy Factory] sat three  homes owned by an extremely influential middle eastern Ambassador to the United States. The larger of the three was occupied by the Ambassador and his family. The second largest home was the original home while his current home was being built. This home had a full security command post [call-sign PAPA]. The third and final home was much smaller, but larger than what most are accustomed to living in. This was the residence used for drivers of any guests that stayed in call-sign PAPA. I was close to three  years into my professional career as a full time executive protection agent for Vance International and our team was responsible for the access control and perimeter security of the properties. Inside the main residence the security responsibilities was manned by the British Group Saladin. This team consisted of former SAS, British Military and former British Police. There was a good synergy between us [they called us- Yankees] and Saladin Group [we called them – Brits]. It was a solid relationship with full-time protective coverage 24/7. The property was well known by all of the local police departments to the point that word on the street was that the US Park Police would approach slowly because they knew we were trained and heavily armed on this foreign diplomatic soil. The week leading up to October 22, 1999 was a bit more busier than the normal daily hustle and bustle. Extra grounds keepers tended to the main residence and PAPA. Additionally there was an extra ordinate amount of vendors visiting as well. By Thursday we went “UP” on PAPA. This meant that the second residence’s security command post [CP] was being manned. The confidentiality at the Ambassador’s detail was extremely high and as normal the word had not been passed down as to who was coming. Our detail leader set the schedule for the extra agents and I was assigned to PAPA for the night shift [1800-0600]. On Thursday evening a car pulled up to the call box and the female [known to us] stated that she had to enter the PAPA master bedroom to change the drapes. I told the agent manning the board to allow her in. I rushed upstairs to open the front door, exchanged pleasantries with her and allowed her to do her business. After a couple hours she vacated the residence and the rest of the night entailed manning an empty domicile while staffers ferried in kitchen supplies. The shift ended at 0600 on Friday, October 22, 1999. I parked and entered PAPA from the side door and walked in the CP. I was met by the day-shift agents and grabbed the pass-down log [written details of what happened on the previous shift]. I also looked at the Vance International call-signs working the gatehouse at the main residence. I was told by the PAPA day shift SL [Shift leader] to expect Nelson Mandela around 2000 hours in a US State Department motorcade. I acknowledged and went on with my pre-shift preparations. During the day it was decided to put another post up the hill [can’t remember call-sign] just inside the entrance gate. That meant we had an extra body for the night. By the time I had arrived the Ambassador and his protection team along with his normal State Department package had already left for the airport to meet Nelson Mandela. All there was to do now was wait for the radio transmissions. At approximately 1950 hours or so I heard the familiar heavy voice of “Taft” [the head of the Saladin team] crack the frequency with the normal radio jargon exchange. He was telling everyone they were one  minute out. I waited until the second transmission of “Copper ZERO ZERO’ and then instructed the gates to be opened. What I witnessed next was the first in my neophyte career. A motorcade of about fifteen  or more cars lead by a uniform US Park Police car, followed by US State Department cars coming to ME. As the train of cars came down the hill towards the semi-circular entrance I saw the familiar “LIMO” within the protective vehicular package. The limo pulled directly in front of the main door, and US State Department, Saladin Group and Middle Eastern agents exited and converged into their respective protective positions as the Detail Leader exited the limo and approached the right rear door. I also saw a middle aged woman running for her life from 3 cars back to make it to the right rear of the limo as well. The Detail Leader cracked the door and faces on everyone on the property got stoic The lady reached her hand out at the passenger extended his to be assisted exiting the armored limousine..
As he exited I was surprised at how frail he appeared. Grey haired, Kente shirt and slacks, it seemed to be a long purposeful step-by-step journey into PAPA. I forced myself to stay focused at the task at hand – “I was responsible for him for the next ten [10 hours]. After an hour or so, the Ambassador left to go home next door, limo drivers parked the extra cars on the lot and the over night ambulance sat in a close distance from the front door. For the next hour or so it was extremely quiet. I could vague voices speaking possibly Afrikaans but nothing seemed to be alarming. 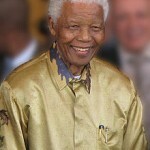 She stated that Mr. Mandela was in the restroom [which was just to the right of the master bedroom entrance]. She left the bedroom and closed the door behind her. I entered the room and made a B-Line to the television and all of the other technological contraptions next to it. My back was to the main entrance and the bathroom door was at my 5 o”clock. I heard the faint squeak of a door opening followed by a slow moving image in my periphery. “FOCUS, FOCUS, FOCUS and get out of here!! 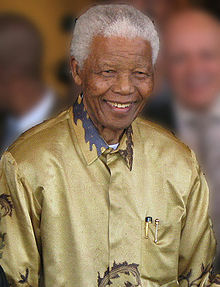 !” I said to myself, as I turned I saw HIM in his silk pajamas walk to the bed and said, “Good evening Mr. Mandela I am going to get this working for you.” He replied, “ANYTHING but the news!” I was saying to myself, “This clear picture of snow across this screen is a great option. Watch that and I can get out of here.” I turned back to focus on the task at hand whereby Mr. Mandela hit me with a bomb and asked, “What is your name sir?” I turned and replied, “Eric sir.” At this time he was in the bed with the covers all the way to his neck. I touched every button on every remote to no avail but then a LIGHT went off in my head – THE DRAPES. As I looked for the opening in the drapes and there was the culprit. When the lady came to change the drapes she had somehow removed one of the cables from the wall. I plugged it back in – “VOILA!! !” I was cooking with hot grease now. I handed him the multitude of remote controls and bid him a good night. He thanked me and I exited the room. 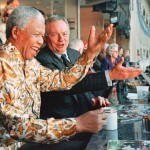 As I returned to the CP to log in the task on the pass-down log I realized that I had been upstairs for an hour, forty-five  minutes of which I had spent alone with the honorable NELSON MANDELA. The next day Saturday, October 23, 1999 the Ambassador had a huge party for Mr. Mandela on the property that was attended by the Who’s Who of the Washington, DC ELITE and government officials. Several artists, including Roberta Flack performed and the party was, to date, the largest private party I have ever been a part of. On Sunday evening October 24, 1999 I arrived for my shift and was advised that PAPA was shut down and to report to the Gatehouse as normal. I was told that the Ambassador and Mr. Mandela had departed earlier that morning. The property was always quiet when the Ambassador was off property. The television on the wall was showing the Washington Redskins versus the Dallas Cowboys football game at Texas Stadium. Some time during the game John Madden announced that there was a helicopter landing outside the stadium, The cameras switched from the game to show the helicopter land. 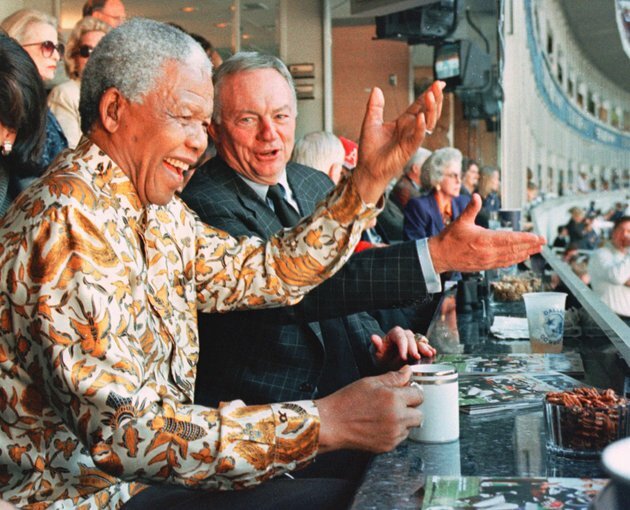 Madden announced that he was told that Nelson Mandela was arriving with the Ambassador of XXXXX XXXXXX as a guest of Jerry Jones. I have been up close and in arms reach of five United States Presidents and each moment has a special place in my career and life. I have held this entire story for many years and have only blurted out moments of that weekend. It was not until yesterday’s news that the Honorable Nelson Mandela passed away that I decided to tell my personal story of the 45 minutes alone in the bedroom with him. The sound of him calling me “Sir” still rings in my ear because I can’t make sense of it. I was NOT worthy of that from him, but in his own INVICTUS way he blessed me. Thank you so much Mr. Konohia for sharing that story. Your professionalism and opsec is something to be admired. I can’t imagine the emotions you are probably feeling today. I think that when we are in the presence of greatness, we should all acknowledge it and share it if and when it’s permitted. Thank you again. Thanks for sharing Eric. Must had been an awesome feeling to meet this great man.